WESTWOOD, Mass. – Playing on the road is no easy feat, especially in the playoffs. 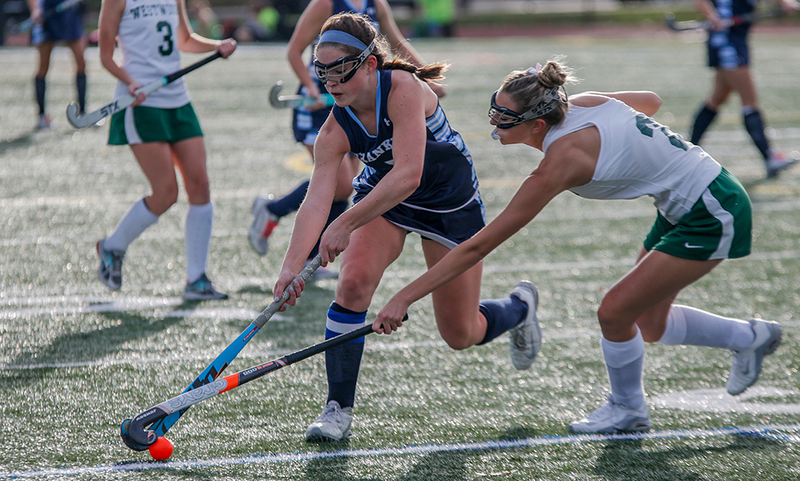 The Franklin girls field hockey team started strong, survived a comeback attempt and finished with a comfortable 7-3 victory over #15 Westwood in the preliminary round of the MIAA D1 South State Tournament. Just 19 seconds into the game, Franklin got their first corner opportunity, and while they were unable to convert, they would get two others before two minutes would tick down on the clock. On their third attempt, Cassi Ronan saw her aerial just got over the top of the net, but seconds later, on Franklin’s fourth corner of the first half, Ronan was able to find the back of the net to put the Panthers up 1-0. Franklin earned two more corners at the 23:50 and the 23:17 marks, but stout defense and play from Westwood goalie Megan Brown would keep the Franklin lead at 1-0. However, on their sixth corner of the first half, Victoria Quinn would find the back of the net, and the Panthers led 2-0. Westwood finally got its offense going with its first corner at the 21:57 mark of the first half, but Franklin was able to keep the Wolverines off the board. Four minutes later, Maddy Hinckley’s stick found the ball after a kick save by Brown, and she flicked it past the keeper to put the Panthers up 3-0. 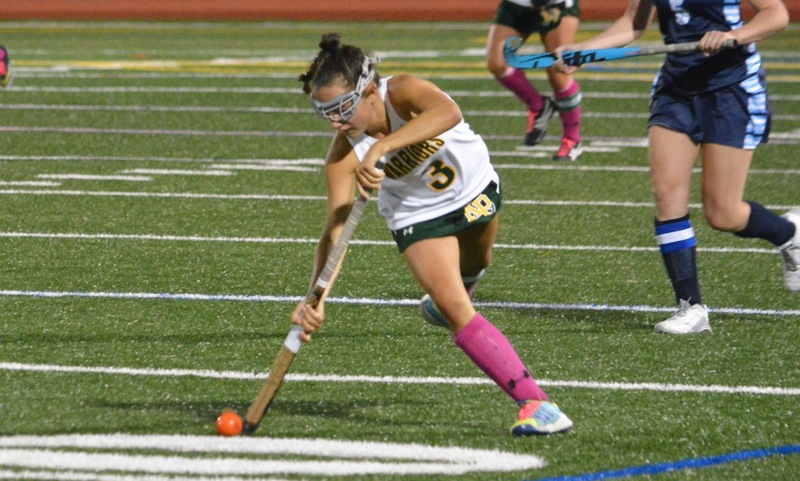 Westwood would get on the board ten minutes later when Theresa Healy was able to get around the Franklin defense and drive her shot into the back of the net to make the score 3-1. Two minutes later, on Franklin’s eighth corner of the half, Ronan once again had an aerial, but it just nicked off the crossbar, and Brown was able to clear it just in front of the net to keep the Westwood deficit at two goals. In the second half, Franklin’s offense got off to another strong start with Ronan scoring just over five minutes into the half to extend the Panthers’ lead to 4-1. After Ronan’s goal, Westwood came roaring back as Kayla Conway scored to cut the Franklin lead to 4-2 with 18:42 left in the game, and off another corner, Healy scored her second goal of the game to cut the lead to just one at 4-3. With 10:15 left to go in the game, Ronan completed the hat trick and put Franklin up 5-3, placing a perfectly lofted ball over Brown off a corner, and from there the Panthers never looked back, as Amanda Lewandowski and Natalie Stott added goals in the final ten minutes to give the Panthers a 7-3 victory. 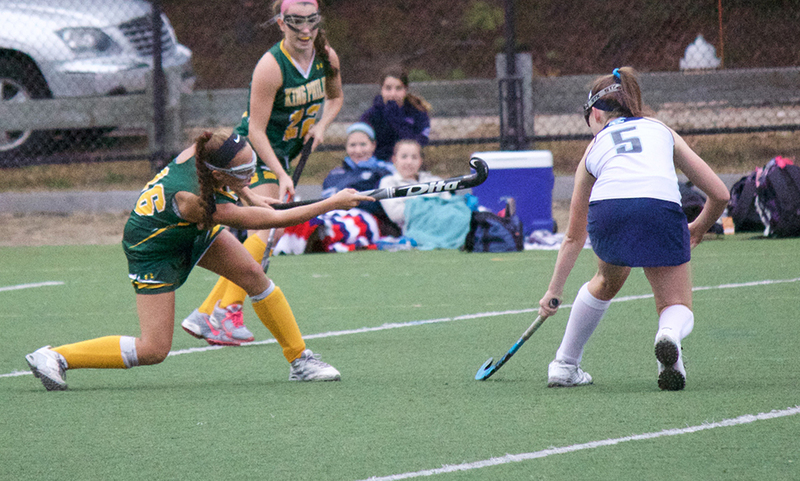 With the win, Franklin field hockey moves on to face Kelley-Rex champions King Philip Saturday afternoon. The two teams met twice this season, and both those times the Warriors came out on top. “It’s difficult to beat a team three times, and we’ve been right there with them both times, even the game that we lost last week, we outplayed them in the middle of the field, we just didn’t convert on our chances and they converted on theirs. ” Cropper said about the Panthers’ next matchup. The Warriors (15-2) received a bye in the MIAA tournament and will host the Panthers on Saturday, November 4th at 3:00 at Macktaz Field. 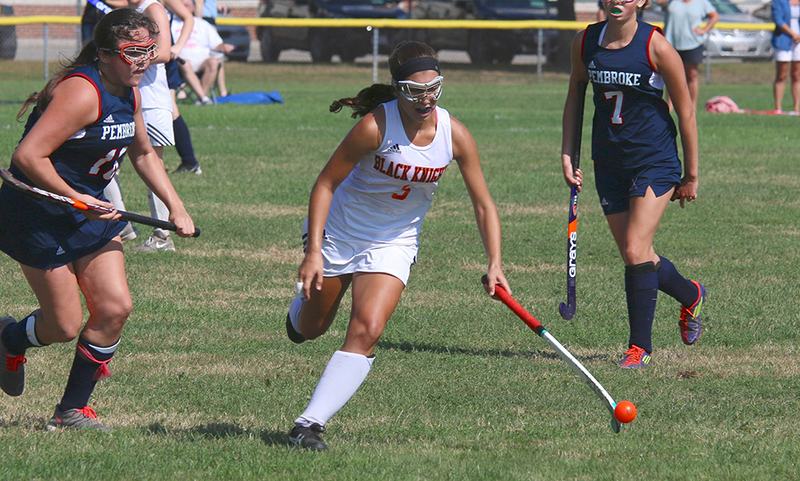 Click here for the 2015 HockomockSports.com Field Hockey Awards. FRANKLIN, Mass. – Franklin and King Philip faced off in the Div. 1 South tournament on Friday afternoon at the Beaver Street field. It was the third meeting between the two Kelley-Rex rivals this season with the Panthers winning each of the first two by a single goal both times. Friday’s game would not be as close. 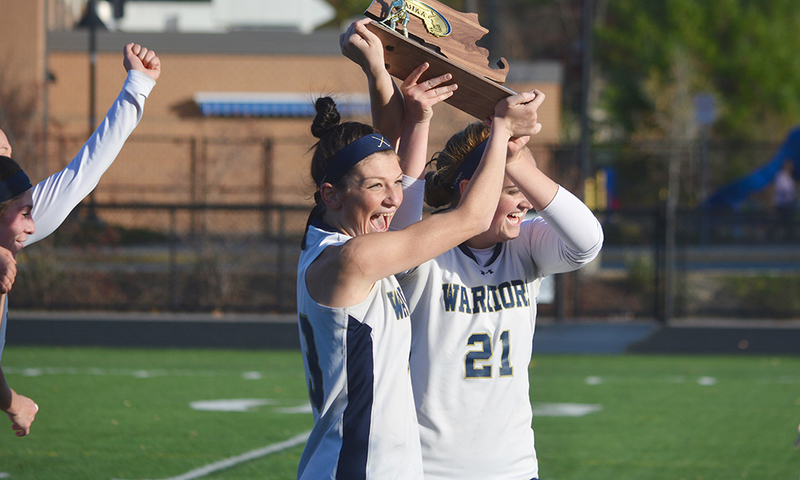 The Warriors were coming off a thrilling, but draining, stroke-off win against Plymouth South in the opening round and the Panthers took advantage of the extra preparation time to create more offense. It all worked for the home team and Franklin would come away with a 4-0 win that advances the Panthers to the sectional quarterfinal and a rematch with Dennis-Yarmouth on the Beaver Street turf on Sunday. 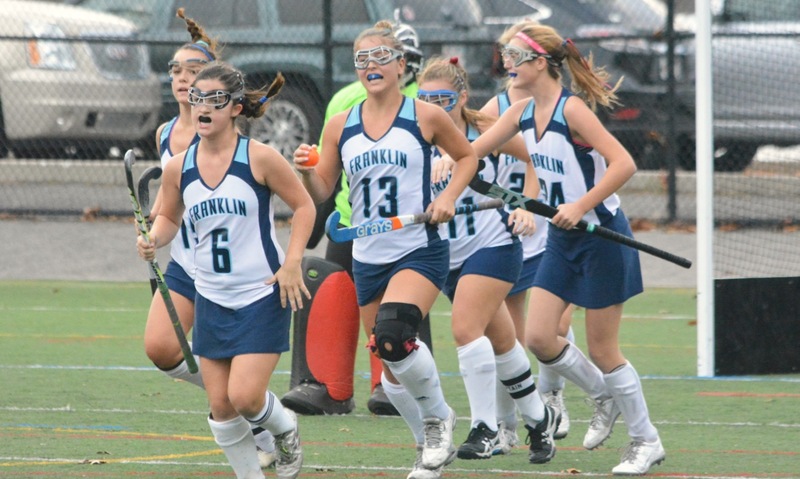 “I was not looking forward to having to beat [KP] a third time,” admitted Franklin coach Lisa Cropper after the game. It was actually the Warriors that had the better chances in the opening minutes of the game. Franklin goalie Sam Jones was forced into two big saves right off the opening whistle and it looked like the confidence of Wednesday’s win may be leading KP to another upset. But, after the first five minutes, Franklin took control. First the Panthers hit the post on a quick break and then Kelsey McPhee opened the scoring off an assist from freshman Annie Walsh in the 11th minute. In the 23rd minute, Franklin doubled its lead when another freshman, Cassi Ronan, found the back of the net on a first-time shot from senior Taylor Reutlinger’s assist. 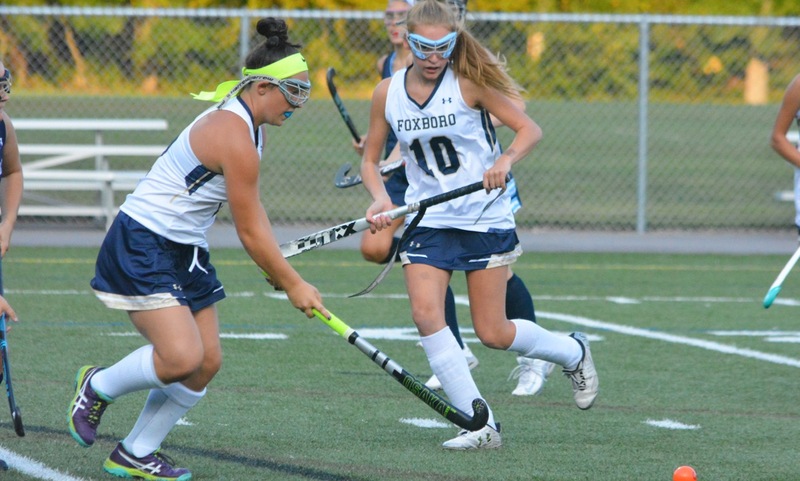 The Warriors tried to get the ball forward, particularly down the wings, looking for attackers Casie Curtin and Mary O’Connor, but each time the pay was cut off by Franklin’s strong midfield, including senior Kenzie Pleshaw who had a number of interceptions. As the game wore on, Franklin’s pressure intensified. KP had a chance eight minutes after the break but again Jones was equal to the shot at her post and kicked it aside. Four minutes later and Franklin had the dagger. Walsh’s initial shot was saved by sophomore goalie Abby Campbell, who made 12 saves in the game, but Diana Griffin followed up and knocked in the rebound. Two minutes after that, the Panthers struck again on the break. This time it was Griffin playing provider with a long pass out of midfield right to the stick of Walsh and the freshman coolly knocked it home. Although the final score was not as close as the two regular season games, Hathaway took nothing away from the play of her team and gave all the credit to the hosts. A cheer went up from the Franklin bench when it was informed that the next opponent woul be Dennis-Yarmouth. The Panthers have been knocked out each of the last two seasons by D-Y and both times on the road. Now, D-Y has to come to Franklin.